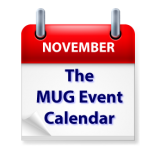 A very busy is coming up on The MUG Event Calendar. Bob “Dr. Mac” LeVitus is on tour in Pennsylvania and New Jersey this week, visiting three different groups. Jeff Gamet will talk to a Colorado group about iOS, Larry O’Connor of Other World Computing (OWC) will talk to a group in Texas, and Lesa Snider will make two virtual appearances, one to a New York Group and the other to a Texas group to talk digital photos. Other topics on the list for the week include digital estate planning, audio editing, security, Google Services, social media and more.